You see, in this world there’s two kinds of people, my friend: Those with loaded guns and those who dig. 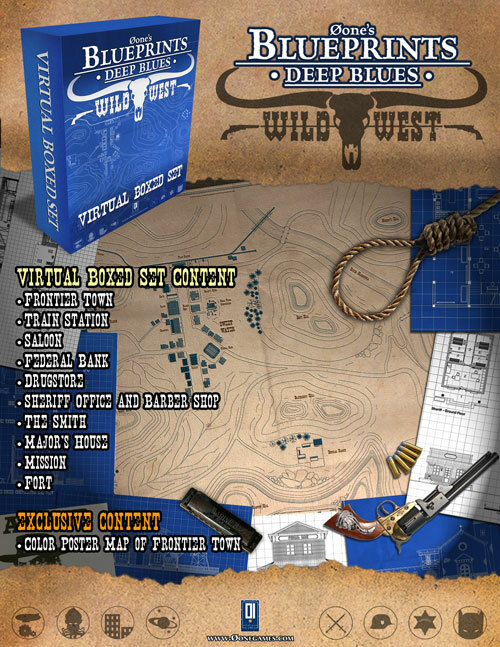 Welcome to the Wild West Virtual Boxed Set©, it contains every map you need to set up a far west or fantasy west campaign. This Boxed Set contains Ten Deep Blues Blueprints plus a color map. The color map is a color version of the Frontier Town Map with more colorful names and locations. It contains a overview map of a town and its neighborhood. It includes a small town, a mission, a fort, a railroad, a redskins camp, a ranch and more. Train Station contains floorplans, sections and front view of another classic Wild West location. In this Blueprint you will find floorplans, sections and front view of a classic western saloon with bedrooms on the upper floor. In this Blueprint you will find floorplans, sections and front view of a classic western federal bank. In this Blueprint you will find floorplans, sections and front view of a old west drugstore. In this Blueprint you will find floorplans, sections and front view of another must-have old west location, the sheriff’s office, complete with a small jail. You will find also a small barber shop. The Smith details a smith shop, workshop and house. A map of a house under construction is also provided. In this Blueprint you will find floorplans, sections and front view of a major’s house plus a generic house. In this Blueprint you will find floorplans, sections and front view of a misson, a church built just outside the Frontier Town. In this Blueprint you will find floorplans, sections and front view of a fort.